We would like to sincerely thank you for entrusting us with your affairs in Greece and inform you of the opening of the TaxisNet System as of March 28, 2019. The deadline for the submission of tax declarations in Greece is on June 30, 2019. 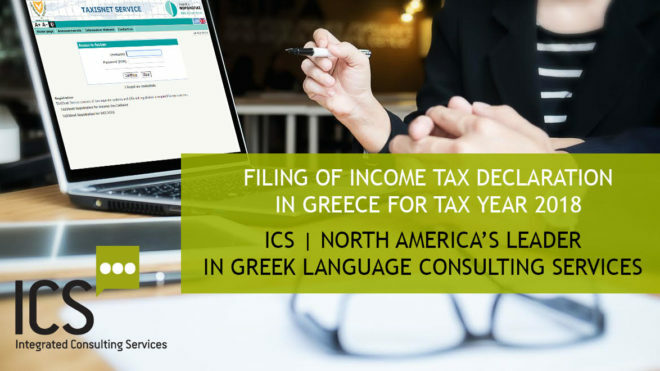 This means, that we must now file your applicable tax declarations in Greece and update your taxation records before the competent Public Revenue Agency namely, the Public Revenue Agency for Foreign Residents where your Tax Identification Number(Α.Φ.Μ.) is now registered. In order to conclude any pending case of yours, to ensure the proper management of your estate and to fulfill this year’s tax obligation in Greece, you are kindly asked to schedule a visit at one of our offices in order to submit payment for the filing of your tax declarations, as well as any other outstanding amounts for unpaid taxes, either from last year’s income tax declaration or from the unified property tax (ΕΝΦΙΑ). © Integrated Consulting Services 2018.